It's Friday! 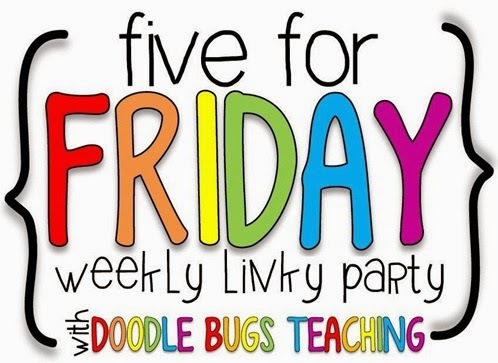 Which is typically a good thing but this week it means that Spring Break is coming to a close... Keeping up with my new found blogging stamina, I thought I'd link up and share some of my weekly adventures with Doodle Bugs Teaching in her Five for Friday! My goal over break was to do some shopping and couponing! Kroger was having a great buy 5 Save $5 sale and I was testing out some new couponing apps. I'd say my shopping trips were a success! I even organized all my nonperishables in my teeny-tiny bathroom closet with $1 Target magazine holders that I had a Cartwheel for 10% off! I also bought myself a few things. That's what a staycation is all about right?... My Treat Yo Self purchases included a new water bottle (Target) and some new clothes (Old Navy). I plan on ending my break with a trip to Divergent! Over break I found some gift cards from students for Regal and a coupon on Ibotta! If you haven't tried out the free Ibotta app - it's totally worth it! Extra coupons equal more money in your pocket! I did do a little planning and prep work over break as well. I made sure all our word wall words for Canada were ready to go! I also put all the students images into a SMART notebook file for easy copying and studying! Don't forget to check out Five for Friday and follow me on instagram! I've been way better about keeping up with instagram than the blog as of late! I love your selfies! So cute. I'm super proud of all of your couponing and saving. You are inspiring me to get back into this! Hey, Amanda! Looks like you did some fun stuff over break!! I love your students pictures for Canada! They're so great! I'm definitely going to look into some of those apps! Visit to friv 4 than play games 2 girls and play game kids games ! have fun!